Garner selected for vacant KCKCC board position – Welcome to Wyandotte Daily! Kansas City, Kansas, Deputy Police Chief Tyrone A. Garner was selected on Tuesday for an open Kansas City Kansas Community College Board of Trustees position. Garner, the only one who applied for the position, will be sworn in at the April 18 meeting, according to Peggy Friedmann, KCKCC executive administrative assistant. Garner will fill the remainder of Clyde Townsend’s term as a trustee, until the November 2017 election candidates take office, Friedmann said. Townsend resigned earlier this year for health reasons. Townsend, a former Wyandotte County commissioner, had served on the Board of Trustees since 2005. The appointment will be through the next general election. At the November election, a trustee will be chosen to serve out the remainder of Townsend’s term, through 2019. Garner expressed interest in helping youth during the selection process, and the trustees were impressed by his credentials, Friedmann said. Garner holds a Bachelor of Arts degree in management and human relations from Mid-America Nazarene University, and a master’s degree in human resources from Ottawa University. He also has an Associate of Arts degree in general studies from KCKCC. He is currently a member of the Kansas City, Kansas, Housing Authority Board, the Adhoc Group against Crime board, the University of Kansas Hospital Pediatric Ethics Committee Advisory Board, and the KCK Black Chamber of Commerce. 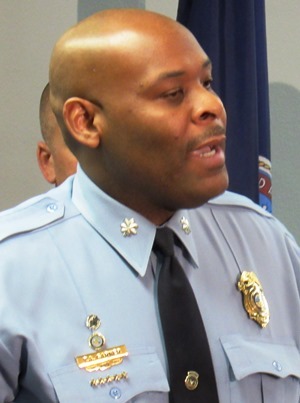 Garner became a Kansas City, Kansas, police cadet in 1987, and also served as a U.S. Army military police officer. He was named a police detective in 1995, and became assistant division commander in 2002. He has been deputy chief of police since January 2015. Garner also has served as a past African American Affairs Commissioner, appointed by the governor from the 3rd District, and is a past chair of the Wyandotte County Community Corrections Board. He has received the Kansas City, Kansas, NAACP Community Icon Award in 2015, the Friends of Yates Man of Distinction Award in 2014, and a Tuskegee Airman chapter Community Service Award in 2016. He is also a past recipient of the KCK Police Department Valor Award. Garner was also a candidate when trustees selected Roslyn Brown to fill the unexpired term of Maryann Flunder in 2016, and he came within one vote of being chosen for that position. He ran unsuccessfully for the Kansas City, Kansas, Board of Education in 2013, placing fifth with 11.9 percent of the vote.